Confectionique: Introducing . . . Brocanturee on Etsy! Introducing . . . Brocanturee on Etsy! Life is short . . . why not fill it with pretty things? We are proud to announce the opening of Brocanturee, the new online brocante (or flea market) of Confectionique . . . and only on Etsy! On Brocanturee, you will find exclusive treasures you cannot find in our brick and mortar store! Just look for Brocanturee on Etsy, or go to www.brocanturee.com ! Like Confectionique, Brocanturee gives you the opportunity to feel as if you are shopping in a Parisian flea market . . . but without ever leaving your home! We travel to Paris and Europe every year to locate vintage French and European finds to offer you; on Brocanturee we also feature select vintage Americana home decor. 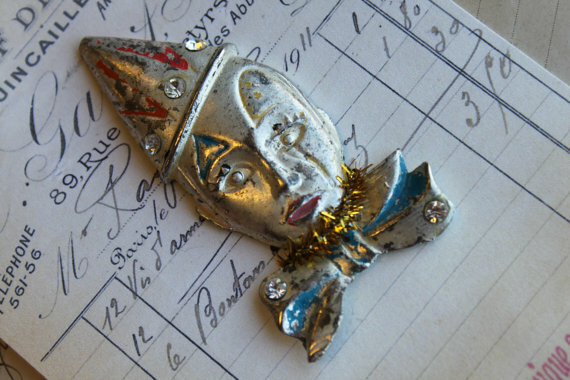 We specialize in general Parisian flea market treasures, and also have a huge cache of rare French paper ephemera and vintage French mercerie (buttons, ribbon, lace and other trimmings). Since we are a new Etsy shop, check back often -- we will be adding new items every week! Just look for the "New This Week" section every Sunday. Paris Brocante Antiques: General flea market finds, primarily from Paris but also from countries such as Italy and Spain. Mercerie (Sewing): General sewing needs, many vintage if not antique, and most from Paris. Here you will find buttons, ribbon, lace and other trimmings. Vintage French Ephemera: Selections from our large cache of antique French and European paper ephemera. We will frequently be adding new selections. Paris Ragaru Ephemera: Selections from the commercial papers of Galleries Ragaru, an antique furniture dealer in 19th- and early 20th-Century Paris. Most of our Ragaru Collection dates from the period of 1908-1913. We will be periodically adding new selections. Vintage Jewelry: Lovely vintage finds, mostly from Parisian flea markets, but some from elsewhere when noted. Exclusively Confectionique: My own handmade crafts as well as our exclusive crafting supplies from Confectionique, our brick and mortar store in Middleton, Wisconsin. Here you will find our own exclusive rubber stamps and fabric swatches, both featuring images from our collection of French and European ephemera. Americana Kitsch: Selections of primarily vintage Mid-American home decor from our travels around the United States. My greatest joy after my family and friends are my travels with my husband hither and yon to gather vintage or treasured finds, to explore, and to be inspired. Our Etsy shop will be filled with lovely vintage finds from those travels. I hope you enjoy exploring Brocanturee!